College is expensive. According to U.S. News, the average tuition and fees at an in-state public college comes out to $9,716, compared with $35,676 for private colleges per year. Public, out-of-state schools cost about $21,629 on average per year. 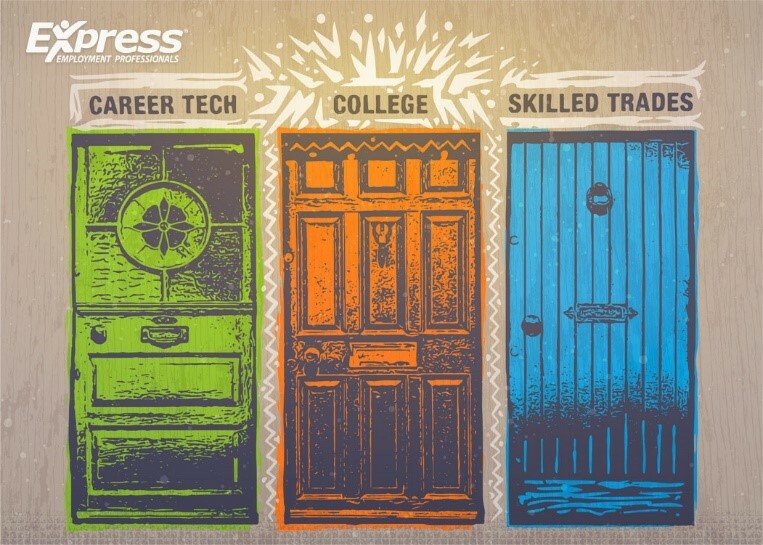 Despite these high sticker prices, survey results from Movin’ On Up, the Express Employment Professionals blog for job seekers, and Refresh Leadership Express’ blog for business leaders, found that parents are still pushing their children to attend college. Interestingly, 33 percent of business leaders and 33 percent of job seekers (coincidentally the same percentage) said that their parent/guardian encouraged them to achieve a four-year college degree or higher. According to the Bureau of Labor Statistics (BLS), 66.7 percent of high school graduates ages 16 to 24 were enrolled in colleges or universities in October 2017. These relatively high college attendance rates resulted in soaring student loan debt. As noted in Forbes, according to Make Lemonade, more than 44 million U.S. borrowers collectively owe $1.5 trillion in student loan debt. Global News notes that Canadian students collectively owe over $28 billion in student loans. Although college can be the perfect choice for many students, it isn’t right for everyone. At the very least, high school graduates should be aware that educational opportunities other than college exist. These include attending career technical or trade schools, and getting into the skilled trades, among other options. Why opt for Career Technical Education (CTE)? CTE-trained workers are in demand. CTE leads to high-paying jobs. CTE keeps the country competitive. Encouraging your children to attend college may be the right choice for your child, but it’s more than worth it to let them know about other available opportunities. College isn’t for everyone, and other good-paying options exist. If you’re a graduating senior trying to figure out if college is right for you, or a parent looking to help their child along their career path, contact Express Employment Professionals. We work with clients every day and know exactly what they’re providing for employees. And we never charge a fee to applicants. We also provide Job Genius, an educational program designed to teach young adults how to successfully enter the workforce. Take a look at our video about hot jobs with high school diplomas and apprenticeships. After that, contact a local Express office, register online or check out our app today to get started.